Small volumes of anti-Elk1 antibody vial(s) may occasionally become entrapped in the seal of the product vial during shipment and storage. If necessary, briefly centrifuge the vial on a tabletop centrifuge to dislodge any liquid in the container`s cap. Certain products may require to ship with dry ice and additional dry ice fee may apply. Description: This gene is a member of the Ets family of transcription factors and of the ternary complex factor (TCF) subfamily. Proteins of the TCF subfamily form a ternary complex by binding to the the serum response factor and the serum reponse element in the promoter of the c-fos proto-oncogene. Function: Transcription factor that binds to purine-rich DNA sequences. Forms a ternary complex with SRF and the ETS and SRF motifs of the serum response element (SRE) on the promoter region of immediate early genes such as FOS and IER2. Induces target gene transcription upon JNK-signaling pathway stimulation (By similarity). Subunit Structure: Interacts in its sumoylated form with PIAS2/PIASX which enhances its transcriptional activator activity (PubMed:15920481). Interacts with MAD2L2; the interaction is direct and promotes phosphorylation by the kinases MAPK8 and/or MAPK9 (PubMed:17296730). Interacts with POU1F1 (PubMed:26612202). Post-translational Modifications: Sumoylation represses transcriptional activator activity as it results in recruitment of HDAC2 to target gene promoters which leads to decreased histone acetylation and reduced transactivator activity. It also regulates nuclear retention.On mitogenic stimulation, phosphorylated on C-terminal serine and threonine residues by MAPK1. Ser-383 and Ser-389 are the preferred sites for MAPK1. In vitro, phosphorylation by MAPK1 potentiates ternary complex formation with the serum responses factors, SRE and SRF. 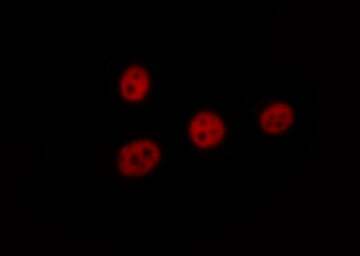 Also phosphorylated on Ser-383 by MAPK8 and/or MAKP9. Phosphorylation leads to loss of sumoylation and restores transcriptional activator activity. Phosphorylated and activated by CAMK4, MAPK11, MAPK12 and MAPK14. Upon bFGF stimulus, phosphorylated by PAK1 (By similarity). Similarity: Belongs to the ETS family. MBS9600983 staining HeLa by IF/ICC. The sample were fixed with PFA and permeabilized in 0.1% Triton X-100, then blocked in 10% serum for 45 minutes at 25 degree C. The primary antibody was diluted at 1/200 and incubated with the sample for 1 hour at 37 degree C. An Alexa Fluor 594 conjugated goat anti-rabbit IgG (H+L) Ab, diluted at 1/600, was used as the secondary antibody. 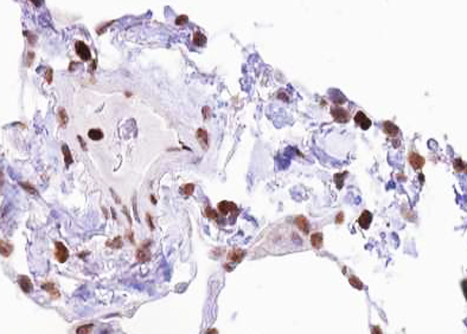 MBS9600983 at 1/100 staining human lung tissue sections by IHC-P. The tissue was formaldehyde fixed and a heat mediated antigen retrieval step in citrate buffer was performed. 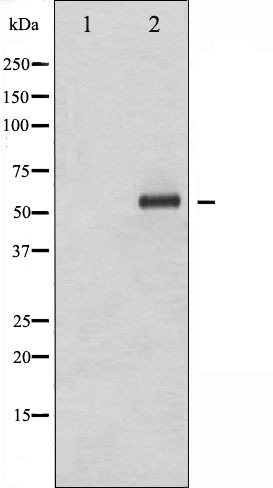 The tissue was then blocked and incubated with the antibody for 1.5 hours at 22 degree C. An HRP conjugated goat anti-rabbit antibody was used as the secondary. 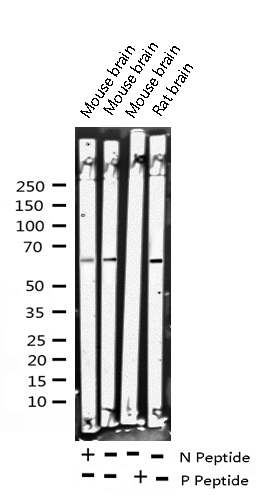 Western blot analysis of Elk1 phosphorylation expression in UV treated HeLa whole cell lysates, The lane on the left is treated with the antigen-specific peptide. NCBI/Uniprot data below describe general gene information for Elk1. It may not necessarily be applicable to this product. Transcription factor that binds to purine-rich DNA sequences. Forms a ternary complex with SRF and the ETS and SRF motifs of the serum response element (SRE) on the promoter region of immediate early genes such as FOS and IER2. Induces target gene transcription upon JNK-signaling pathway stimulation (). 1. Study demonstrates that miR-135a regulates cell proliferation in breast cancer by targeting ELK1 and ELK3 oncogenes, and suggests that miR-135a potentially can act as a tumor suppressor.